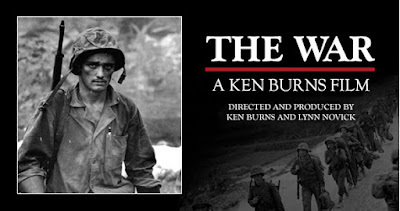 The film recounts the experiences of a number of individuals from these communities as they move through the war in the Pacific, African and European theaters, and focuses on the effect of the war on them, their families and their communities. A number of notable actors including Adam Arkin, Tom Hanks, Ernie Hudson, Samuel L. Jackson, and Eli Wallach are heard as voice actors reading contemporary newspaper articles, telegrams, letters from from the front, etc. The documentary is 14 hours and was broadcast in seven parts on PBS over two weeks, starting on Sunday, September 23, 2007 and continuing four nights the first week and three nights the second week, from 8 to 10 p.m. (8 to 10:30 p.m. on three nights).